By the end of this course you should know what a glucose transporter is, where the various types are found in the body and the role they play in diabetes. This should give you an overview of the importance of glucose and how it is transported within the cells of our body. You should know a bit about glucose transporters already. Test your knowledge by matching up several key terms to their definitions. Below are some key terms you may have come across before. Test your knowledge by matching the terms with their definitions! A hormone that regulates blood glucose concentration. The main form of energy constantly being used and produced by the body. The protein through which glucose can enter a cell. This does not require energy. A form of diabetes where the body does not produce insulin. A form of diabetes where the body does not respond to insulin. The passive transfer of molecules down a concentration gradient that goes from high to low. Glucose is a key component because it provides energy in the form of ATP. This energy is required for the many processes the body carries out, such as anaerobic/aerobic respiration and muscle contractions. ATP cannot be stored in the same way that other energy sources can so it is constantly being produced. The brain is limited in what it can use as fuel therefore glucose is unique in that it can be processed for energy. Therefore it can be said that glucose has an impact on both our cognitive and physiological processes. Can ATP be stored in the body for later use? Yes, in the same way that glucose can be stored as glycogen. Yes, but only a small amount is stored. Cells contain proteins on their membrane surface which allow the entry and exit of glucose molecules. These are called glucose transporters. Glucose transporters are more commonly referred to as GLUTs. They are proteins which facilitate the passive transfer of glucose from one side of the cell membrane to the other side. 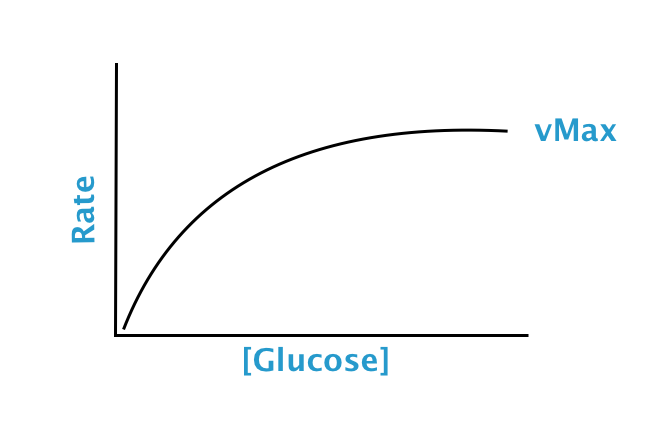 The movement of glucose relies on concentration gradients instead of energy input. When there is a higher concentration of glucose outside the cell compared to the inside of the cell then glucose will move in via the GLUTs. 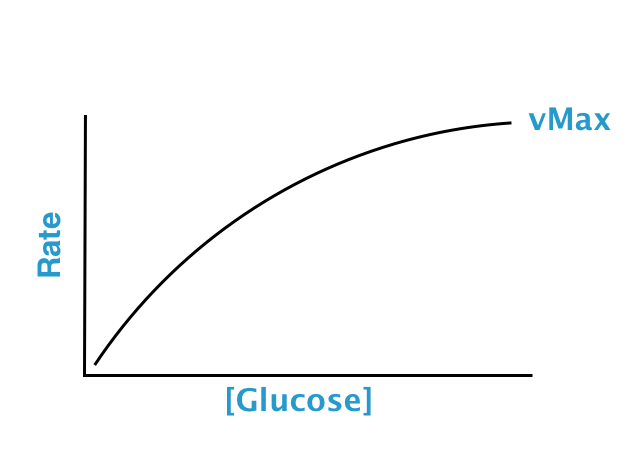 As more glucose enters the cell and is used up in processes such as respiration and cell growth, the concentration of glucose in the blood decreases. There are different types of glucose transporters depending on where they are found in the body. After a meal, blood glucose concentration increases. This leads to production of a hormone called insulin from the beta cells of the Islets of Langerhans found in the pancreas. Insulin is important for glucose homeostasis. When blood glucose levels rise to a concentration that is considered above normal, insulin initiates the opening of GLUTs on the surface of cells. This allows increased uptake of glucose from the blood. The regulation of insulin is very important because prolonged production of it will eventually lead to blood sugar levels becoming too low. In response to decrease blood glucose, glucagon is produced from the alpha cells of the Islets of Langerhans. Insulin is produced when blood glucose levels get too low. Insulin is produced when blood glucose levels get too high. Glucagon is produced by the beta cells of the Islets of Langerhans. Glucagon is produced by the alpha cells of the Islets of Langerhans. In type 1 diabetes mellitus, insulin is not produced by the pancreas. In type 2 diabetes mellitus, insulin is produced but the cells of the body do not respond to it. The problem that sufferers of diabetes face is that they are not able to regulate their blood glucose concentrations. In type 1 diabetes, regular insulin injections are required. In type 2 diabetes the patient is encouraged to make several lifestyle and dietary changes. The features of the GLUT1 receptor and its mechanism of action. Can you remember the sequence of events that occur when a glucose molecule is taken up? Different types of glucose transporters will have differing kinetic properties in relation to their function. There are some key terms which you may or may not have come across before. Also known as the Michaelis constant, this is the measure of when the reaction is at half the maximum rate. This is the maximum rate of the reaction. At this point, the graph has levelled off to a constant rate. How "fussy" the receptor is. If a receptor is said to not be very specific, then any molecule which is similar to the substrate will be able to bind to the binding site of the receptor. How well a substrate is able to remain attached to its binding site. At 1.5mM, half of the transporters with outward facing binding sites are bound to glucose. The features of the GLUT2 receptor and its mechanism of action. The mechanism of action of GLUT2 is similar to GLUT1 in that it uses facilitative diffusion. 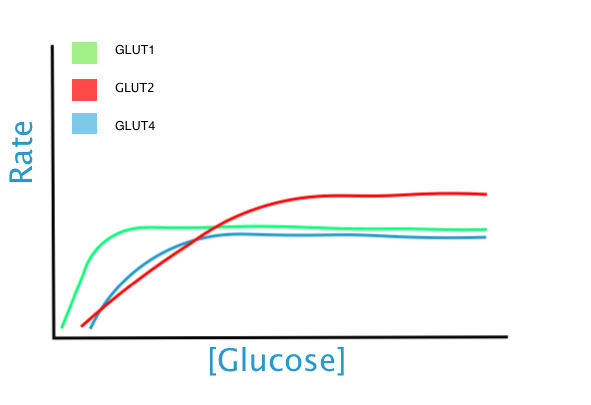 GLUT2 works by sensing glucose concentration and altering the rate of glucose uptake into liver cells in response to this. Therefore, it can be said that it is important for glucose homeostasis. GLUT2 differs from GLUT1 in that it has a higher Km. This explains its lower affinity for glucose however, as mentioned before, it does have a higher capacity. The features of the GLUT4 receptor and its mechanism of action. regulates glucose uptake into these cells by recruiting containing GLUT1GLUT2GLUT4 from the cell interior to the cell surface. diffusion occurs and enters the cytoplasm and is phosphorylated. This is a reversible process. On this graph, you can see the different Kms and vMaxs of the different GLUTs. GLUT4 mutations affect all three of the mechanisms mentioned above. What are the respective Kms of GLUT1, GLUT2 and GLUT4? Why is GLUT4 different to GLUT1 and GLUT2? Write the similarities and differences between the different GLUTs. Where are the different glucose transporters found? It is thought that a loss of selective permeability is seen in the GLUT1 receptors of sufferers of type 2 diabetes. This leads to a decrease in glucose transport from the blood to the cell. Studies show that mutations in the GLUT2 gene may be associated with type 2 diabetes mellitus. It was discovered that in patients with type 2 diabetes, there was a decrease in production of GLUT2 mRNA in comparison to a patient who did not suffer from diabetes. Type 2 diabetes can also be linked to GLUT4 receptors due to the fact that insulin can no longer stimulate the uptake of glucose into fat and muscle cells. In your opinion, what area should scientists focus their future research on in order to develop effective treatments for type 2 diabetes? Using the information you have learnt in this resource, your lecture notes and science articles write a couple of paragraphs on what you believe to be the key areas of focus. In order to one day develop an effective treatment for diabetes, it would be beneficial to focus on the various glucose transporters, in particular GLUT4 as its function depends on insulin. Another area of interest could be GLUT2. The resistance in this receptor which is seen during diabetes has been shown to be reversible when in certain conditions. What did you think of this course? Here is your chance to give your honest opinion of this resource! Was this resource easy to use? Were the instructions for the tasks clear? Did you find the tasks engaging? Did the diagrams and animations help provide a better understanding of the topic? What was good about this resource? What could be improved about this resource?